Yesterday I was talking to a non-Christian student who has his transfer of status today. When I told him it's the feast of the guardian angels he smiled straightaway, and expressed the fervent hope that his angel would bring a few friends along to give him as much help as possible. We may not believe in heavenly beings with curly hair and wings, but we do believe - or want to believe - in guardian angels. There is something comforting about the thought of a being, appointed by God, whose main or sole concern is our safety and wellbeing. 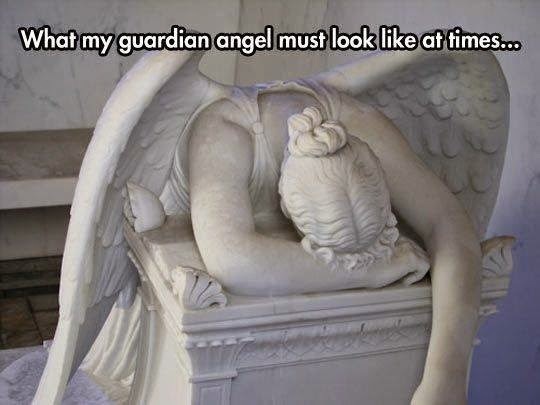 For some of us that being is a beloved relative or friend in heaven; for others their guardian angel is still very much alive, someone who manages to be there at the right times, instinctively intervening (or holding back) in the most helpful way. Hollywood gave us a wise and wise-cracking angel disguised as a sweet old man (Clarence in Frank Capra's It's a Wonderful Life) while CBS gave us whole hierarchies and cohorts intervening in difficult situations in Touched by an Angel. Behind the whimsy lies a reinforcement of the idea that God watches over and cares for us and will send us the assistance we need when we need it - though often in disguise and maybe even unknown to us. That, I think, is how true angels operate - quietly, wisely and well away from the limelight. Whoever or whatever our guardian angel may be, today is a good day for giving thanks for them, especially the ones who will forever remain unknown to us - but not to God. And if this picture raises a chuckle or a wry smile or comment, then maybe today's also a good day for taking extra care of ourselves and giving our guardians a day of rest!